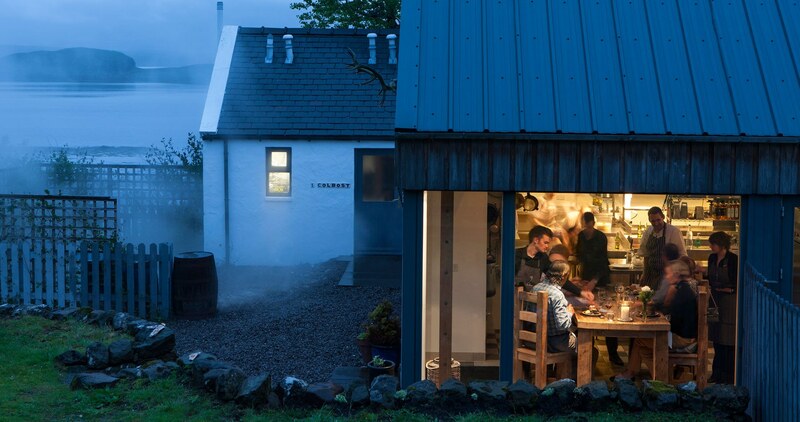 Dinner at our Kitchen Table is a not-to-be-missed experience for anyone visiting the Isle of Skye. The kitchen was designed to accommodate this rustic table and chairs within its own special area. There is no partitioning, glass, or cameras: just the full performance of our Chefs at work! You are seated with a great view and will soon become immersed in the whole tableau of our busy kitchen. There will be plenty of opportunities to talk to the Chefs and Waiters. The Kitchen Table can seat eight people as one party and can be reserved for exclusive use for 2 or more, or shared with other couples. The minimum age for Kitchen Table reservations is 16 years and over. Please telephone us for more details and to discuss your requirements for a unique and memorable occasion. Only the Skye, Land and Sea Tasting Menu is served at the Kitchen Table in the evenings, at a cost of £110 per person for 10 courses, plus our delicious canapes and home-baked bread selection. The Wine & Drinks Pairing selected to match each course is optional and costs £59 per person for 9 glasses. Full details are on the Wine List. Your party will be seated together at 7.30pm and you are most welcome to arrive earlier to enjoy a drink in the Lounge of The House Over-By beforehand so you can meet your fellow diners. On Saturdays and Sundays, the Kitchen Table will be available to book at 12.45pm for the Lunch Tasting Menu only, which will cost £65 per person for 6 courses based upon fresh fish and seafood. We will also serve a Wine Pairing for this Tasting Menu, price £42.50 for 5 glasses.